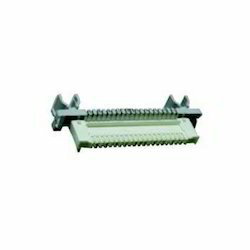 Terminal block or connector up to 95sq mm n more.... Make : elmex , connectewell , IC. HRC Contact Block Terminals from Premium Raw Material Quality Grade for Optimum performance. - Any Special Brass Material Composition As Per Customers Requirement. 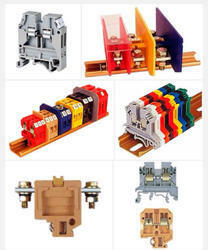 Description : Brass slotted terminal blocks used in fuse. Grade : IS: 319, CuZn39Pb3, CW614N, CZ121, C37710 or as per Customer's Requirement..
Brass Terminal Blocks are used in fitting electrical panel board and switch gear accessories. Brass Terminal Blocks are available in natural brass finish and nickel surface plating with screw brass & mild steel. Manufactured from free cutting brass, these Brass Terminal Blocks are sturdy and able to resist corrosion. Brass Terminal Blocks have been priced reasonably. - Autonics newly introduces I/O terminal block - AFS, ACS, AFE, ABS series. Current Rating: 30, 60 and 100 AMP. Material: High Quality Phenol Formaldehyde Moulding Powder. Screws: MS - Nickel Plated / Zinc Plated / Travelling Plated. Temperature Range: continuous operating temperature of 121 A Degree C (250 A Degree F).. Content: One block and ten knobbed cylinders. We provide Terminal Block to our clients that are available with different specifications and features. Made available by us is a quality-approved Light Voltage Terminal Board. These products are manufactured by experienced professionals employing latest machines and advanced technology following industry set guidelines. To cater to the diverse requirements of customers, we offer these products in various specifications. - Current Rating : 30, 60 and 100 AMP. - Voltage Rating : 500 Volts. - Material : High Quality Phenol Formaldehyde Moulding Powder. - Temperature Range : - continuous operating temperature of 121 °C (250 °F). - Terminal : Brass duly Nickel Plated / Zinc Plated / Travelling Plated. UL, CSA & SEV Approvals Designed to VDE 0110.